The King of Cups sits on his throne on a grey stone block, calmly in the midst of a turbulent sea and wears a necklace with a fish amulet. The fish is the symbol of spirit and creativity and represents the balance of the unconscious with the conscious. Behind him on his right, another fish jumps wildly from the tumultuous ocean, and, on his left, a ship sails steadily in the choppy ocean. Yet it remains within his power and does not overwhelm him. 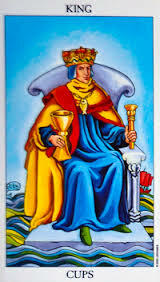 The King of Cups does not repress his emotions and unconscious impulses but has learned to accept and deal with them in a mature and balanced manner. This boss is a real team worker, very supportive and understanding. He is a coach in constant training- Intuitive advisor – therapist. Loving and caring – taking care of the household better than a female – romantic nature.